Roasted peppers and salty prosciutto jump into a saucepan with crushed tomatoes, parsley, cream and vodka. 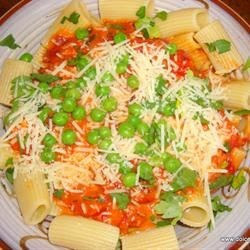 Add Parmesan cheese to the simmered sauce, and toss with cooked rigatoni. Top with peas, if you please.